Take a group of leg weary walkers, throw in a, shall we say, ‘variable’ climate and add a sprinkling of desire for something to make a hard earned holiday or short break just a little more fun and the idea of a Lake District holiday cottage with a hot tub to relax in, in warm bubbling water under the starry northern skies, makes perfect sense. We’ve shortlisted 10 of the best Lake District Cottages with Hot Tubs, from the Scottish borders to the South Cumbrian coast, taking in the heart of the Lake District with cottages in and near Keswick, Coniston and Windermere. With not one, but 2 hot tubs this lovely traditional farmhouse with its open fires and extensive lawned gardens has truly stunning views over the fells. Set in the Lorton Valley, one of North Lakeland’s most beautiful with the three jewel lakes of Buttermere, Crummock Water and Loweswater and close to Whinlatter and Keswick. 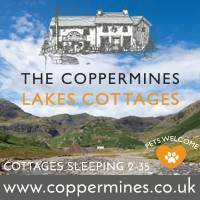 A traditional Lakeland Inn within 15 minutes walk. Up to 2 pets. Tranquility, breathtaking views, a cozy woodburner and a private hot tub on your own balcony, what more could you want from a luxury escape! Four of the nine award-wining 4* and 5* cottages have private hot tubs, others have saunas and steam tubs. All come with free access to a nearby hotel leisure club. Luxurious Lake District cottages with hot tubs, imaginatively converted from a 17th century hill farm. Set in 5 acres of private paddocks and woodland on the edge of the Northern Fells. Some cottages are pet friendly. Nestled at the foot of Blencathra and surrounded by stunning scenery this wonderful cottage sleeps 8 in 4 bedrooms and enjoys plenty of private parking. With central heating, underfloor heating and a wood burner you’ll be cosy as toast even before you soak in the private 6 person hot tub. Bi-folding doors open from the sitting room to enjoy the fabulous views and 2 excellent Lakeland Inns are just over 1 mile away – a perfect summer evening stroll. No pets. Ground level but set among the trees, and partially over a stream, Treehouse Cabin is one of a small number of self catering properties of different types set in 23 acres on this Lakeland Farm on the fringe of the Northern Lakes. A cozy woodburner and a 4 person hot tub make this a very special place. Unusually, it sometimes can be booked for weekends only. Up to 2 pets allowed. 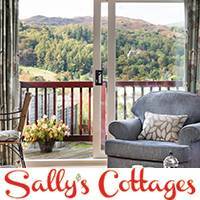 A delightfully rustic mountain cottage offering easy access onto the surrounding Coniston fells. This lovely 2 bedroomed cottage with its cosy open fire enjoys open views towards the Old Man of Coniston. Invigorating walks are available from the front door and there’s a welcoming hot tub to rest those aching muscles after a day on the fells. Pelton Wheel Cottage can also be interlinked into neighbouring cottages for larger groups & gatherings. Up to 4 pets welcome. 14th Century turrets and towers set between the Lake District and Yorkshire Dales national parks and on the edge of Smardale nature reserve on an historic working farm. Excellent for families, top notch walking from the door and the Ribblehead Viaduct & occasional steam trains passing nearby. The market town of Kirkby Stephen is 3 miles and lovely Ravenstonedale a short drive. Turret hideaways, wood burner and an 8 person hot tub add to this immensely characterful cottage. Sorry, no pets. This beautifully appointed first floor appartment is set next to a superb real ale, good food Inn at the foot of The Old Man of Coniston and close to Coniston Water. Play hard outdoors all day then eat like kings, drink in the stunning view as you soak in your private hot tub on your balcony, curl up by your own woodburner or socialise in the Inn and finally sink into the super king size bed at the end of the day. A walker’s paradise and a gorgeous apartment with only room for two! Pets allowed. 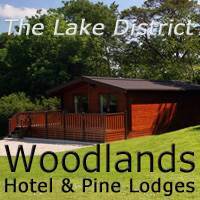 This extremely well designed lodge is set only a few hundred yards from the lake shore on one of Lakeland’s best holiday parks, with excellent park facilities and within easy reach of all the tourist amenities & fun of Bowness-on-Windermere & Ambleside and Windermere and Ullswater lakes. Superb walking from the door and pubs, restaurants and shops within strolling distance. And, of course, your own private deck and hot tub. Pet friendly. Simply but comfortably appointed, this cottage is all about the true Cumbrian rural experience. Situated on the edge of a tiny, quiet farming village in the Cumbrian part of the Yorkshire Dales, this is peace and quiet, a nostalgic escape from recent frenetic times. The village has a small shop & post office and Kirkby Lonsdale is just 4 miles, with shops and Inns, and all the Lakes are within an easy day trip. Relax in your private hot tub and just listen to the birds. Heaven. Sorry, no pets. A magnificent house, set right on the beach with 7 bedrooms and 10 bathrooms, a sauna, oudoor covered hot tub and even its own observation tower. Perfect for large family house parties and plenty to do for everyone for as well as the seaside the Lakes are only 30 minutes away. Sorry, no pets. See cottages by location. Hover over or tap to see more details.